Tired of paying out money to use a system you really don’t understand or know how to use? 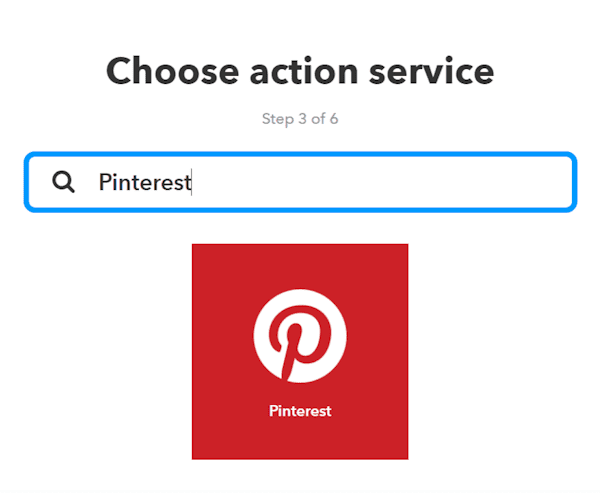 Learn the step by step process on how to loop schedule on Pinterest for free using IFTTT. The longer I have blogged, the more I have needed to become organized with my posts. I realized I needed a list of my posts, published dates, categories, subject matter and where they are being posted on social media. Scheduling posts through a scheduler can be expensive and hard to understand. Even though I make money with my blog, I don’t want any more expenses than I have to pay out. I mean, the object to having a business, and yes blogging is a business, is to make a profit. When I realized I was spending way too much time pinning manually on Pinterest, I needed to find a better solution. I wanted my pins to loop so that I didn’t have to constantly reschedule over and over. I checked into Tailwind, but I just wasn’t ready to pay out more money and they don’t offer to loop pins. There is a loop beta program in the works with Tailwind but that will be an extra charge. More money. After some research, I realized that IFTTT will loop pins on Pinterest and won’t cost me a cent. With a little bit of planning and time, this system works perfectly. By following this step by step process, you will be looping pins before you know it at no cost to you. Since my WP blog is about 10 years old, I have over 1800 blog posts. I needed a super easy way to export my posts from my blog to a CSV list. By using the WP All Export plugin, the process only took a few minutes. Install the WP All Export plugin and look for the All Export tab to the left on your WP dashboard. Be sure to back up your website before adding any new plugin. Don’t have a backup system yet? I use BlogVault and their backup system is made to use with WordPress. My daily backups have saved me a couple times when I needed to go back and restore a previous version of my blog’s files. Their support is super great! I only pay for their backup service which gives me daily backups and a staging site to try out new plugins and other changes on my blog. Once you are in the admin page, you choose whether you want Posts or Pages to list. After the items have uploaded you can Customize how you want the report to look like. Click the Customize button and on the next screen, you will see where you can choose which items you want to show on your report. I only wanted the date and post title. You can add image links and other items associated with posts and pages. It’s an easy Drag and Drop interface that makes this process easy to use. After you have everything you want to show in your report, you can Preview what the report will look like. Once you are satisfied, you are ready to export. Since this is the free version of the plugin, you only have CSV available. But, after you have uploaded the file to your computer, you can save as a .xlsx file easily. Click the Continue button where you will find a few other options, but I didn’t use any of those. When you’ve finished with your settings, click the blue confirm and run Export. It took a couple of minutes for all my posts to export, so if you have just a few posts, it will take just a few seconds. After I opened the list, I deleted the posts that I knew I didn’t want on Pinterest which left me with about 175 posts. I then added Category headings which also coordinate with my Pinterest Boards. 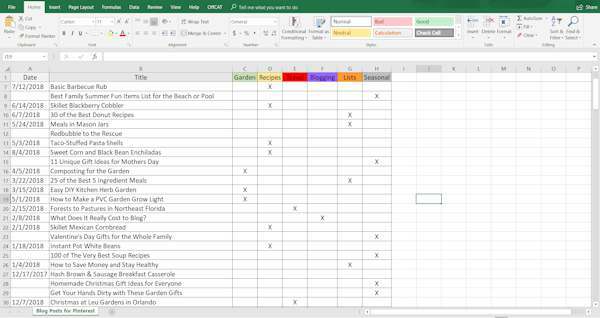 The picture above shows a small section of the spreadsheet but gives you an idea of how I have set it up. 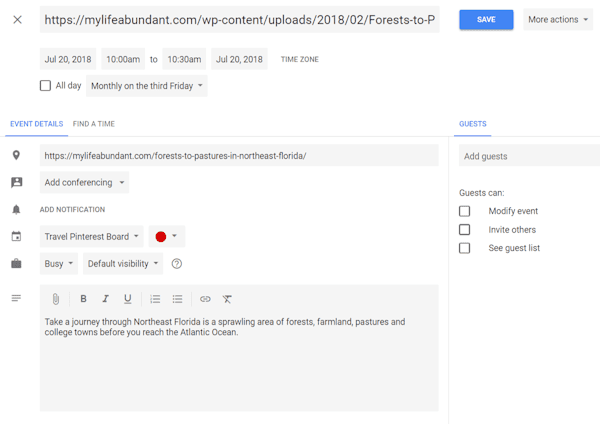 The columns are the post Catagories and when I put a post on the Google Calendar, I would place an X under the category which goes with the post. Keeps me from duplicating posts. The date column is for the date the post was published. 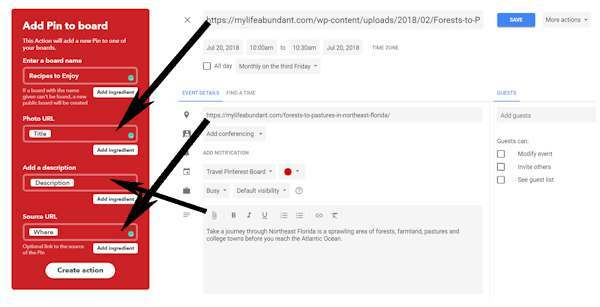 The seasonal posts I will put on a different spreadsheet and I have them marked so I know I don’t want to put them on my Google Calendar until the season comes along. You will need a Gmail account to use the Google Calendar. You can sign up for a free Gmail account HERE. Once you are set up with your Gmail account, you will have access to the Calendar, Docs, and many other helpful items. 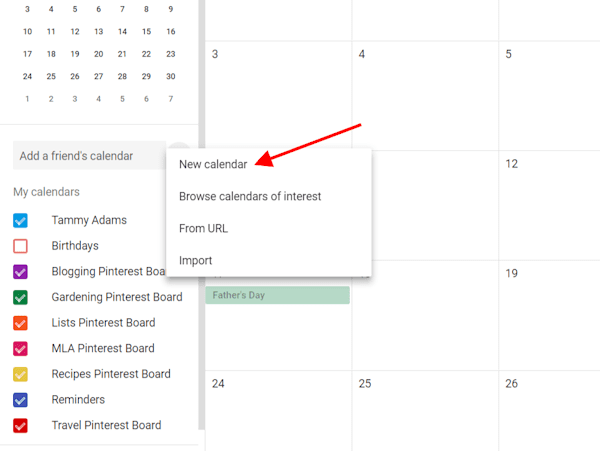 I have a Gmail account I use with my blog and that’s where I will make new Calendars for each Pinterest board category. To add a new calendar, click on + sign next to Add a friend’s calendar to the left. Click New Calendar. When the box pops up, name your calendar to match your Pinterest board and make sure your Time Zone is correct. I did color code all my calendars so that I could also put those colors on my spreadsheet for each Category. 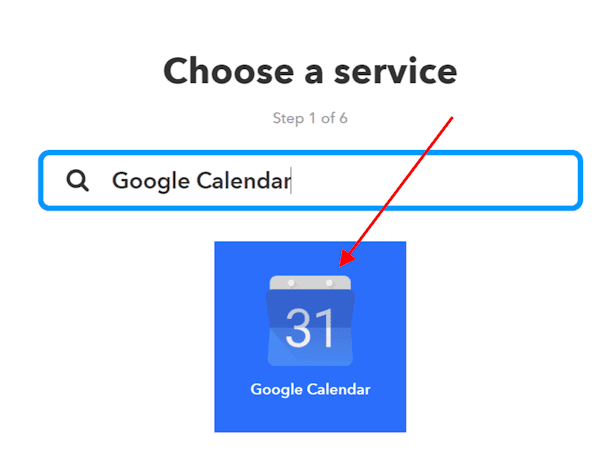 To change the color of the calendar, put your pointer to the right of the calendar name and click on the 3 dots when they appear. To make the pin loop, click off the All Day box so you can change the time and choose how often you want it to pin. I prefer monthly since I have so many pins I want to loop. If you don’t choose anything in this area, your pin won’t loop. By default, the time is always 10 am, so you want to make sure you change your times around so your pins won’t be scheduled at the same time every day. Click save and you will then see your pin on the calendar. Just repeat this process for all your posts. I have been working on this process for a few days and now for each new post I publish on my blog, I will go in and set it up on the Calendar. You can see how my calendar looks after setting up several pins. The color coding of the pins makes it easy to figure out what kind of post will pin in a day. 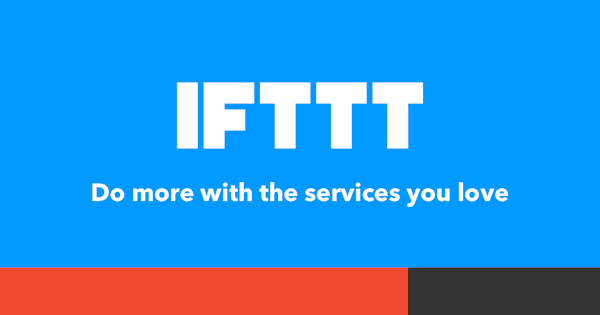 IFTTT.com connects various devices and services together using simple “If this then that” statements and logic. So, we will be doing this action “If any event starts on your google calendar, then add that Pin event to this board”. Sounds pretty easy, so let me show you how easy it really is. 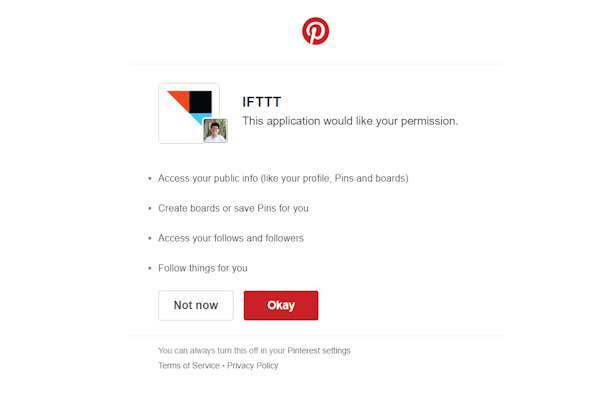 Open up a free account with IFTTT and allow it to connect with your Pinterest account. Next, you will need to set up your Applets at IFTTT. You will also need to make sure you have Pinterest boards that you will be pinning to already set up. I have Applets and boards for recipes, gardening, blogging, lists, crafts, and travel. I only pin my blogs posts to those boards. So, if you need to set up boards just for your websites pins, now is the time to do this. When you are in IFTTT, click on New Applet under your email in the top right-hand corner. Search for Google Calendar and then click on that button. Choose the Any even starts trigger. 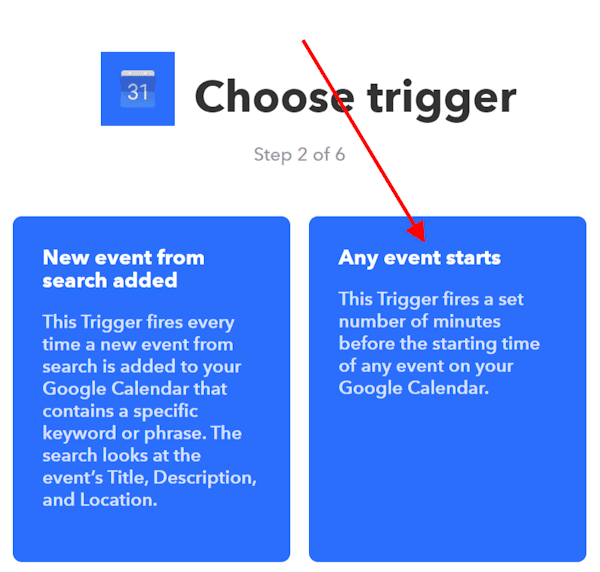 You will next choose what calendar you made to use from your Gmail account to start the trigger. 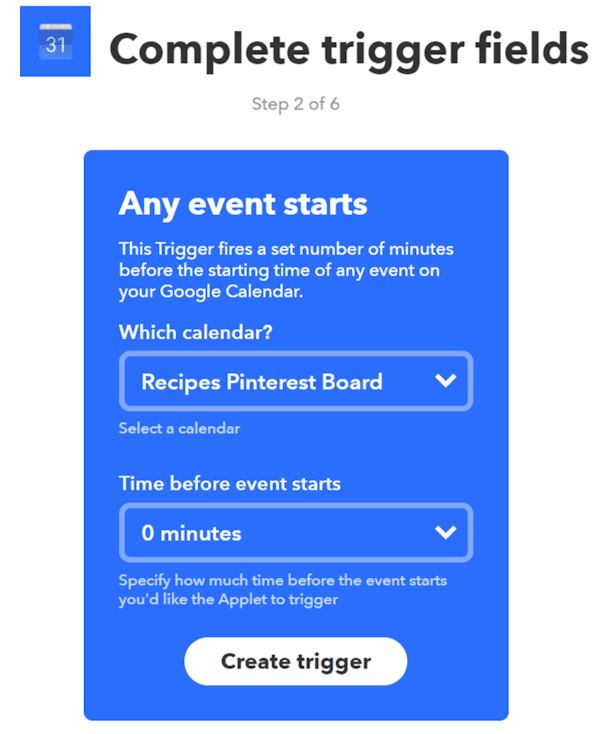 In my case, I wanted to set a trigger to pin in my Recipes Pinterest board, so I will choose the Recipes Calendar. Leave the Time before the event starts at 0 minutes. Click on the Create trigger button. Next click on the blue +that. Search for Pinterest in the search area and choose Pinterest. Next, you will choose an action, so click on Add Pin to board. Its the only option that will show. To fill out the next form, use these settings or your pins won’t work. Especially the tall Pinterest picture you have set up which goes with the blog post. I tried a few different variations to make the picture work correctly and these settings work every time. You will have to delete the default items that are in the spaces when this form opens up. 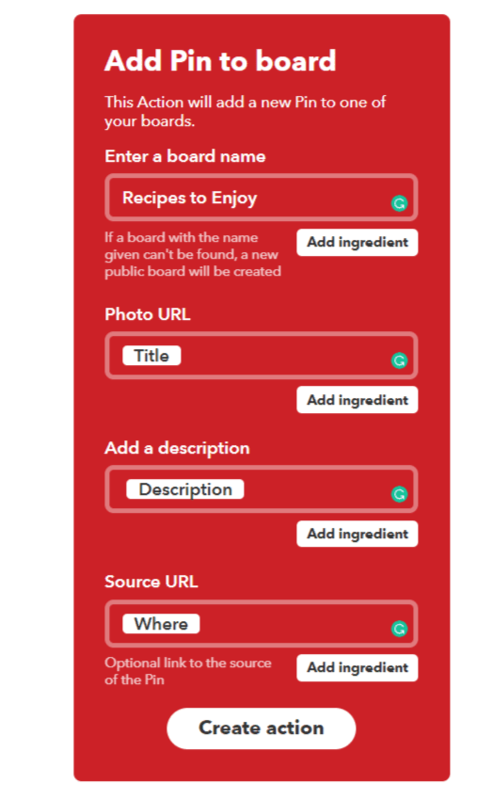 Enter the actual Pinterest board name, click on each of the Add Ingredient buttons to add the Title, Description and Where sources. Click Create action, review the Applet and Finish. The picture above shows how the Calendar works with the Applet. By my settings above, my pin will pin every third Friday of the month. The Photo URL is the Title which is the link to my tall Pinterest picture, the Add a description is the Description which is the pin’s description with hashtags if desired and the Source URL is the Where which is the link to the blog post. Click create action and you are done setting up your Applet. To see if everything is working correctly, you can check your IFTTT accounts Activity Feed. It will show you when an applet is created, running, or if there are any failures. You will need to set up an Applet for every board you want to loop pins too. I have an Applet for my recipes, travel, list, garden, crafts, and blogging idea posts. But once you have the Applets set up, you are good to go. As time goes on, I will change out the tall picture for my posts, keep adding posts as they are published and delete old stale posts. Anyone who has been using Pinterest for awhile knows they are changing their system often. I have read several places that pinning up to 50 pins a day is acceptable!! I don’t think I have ever pinned over 30 a day. 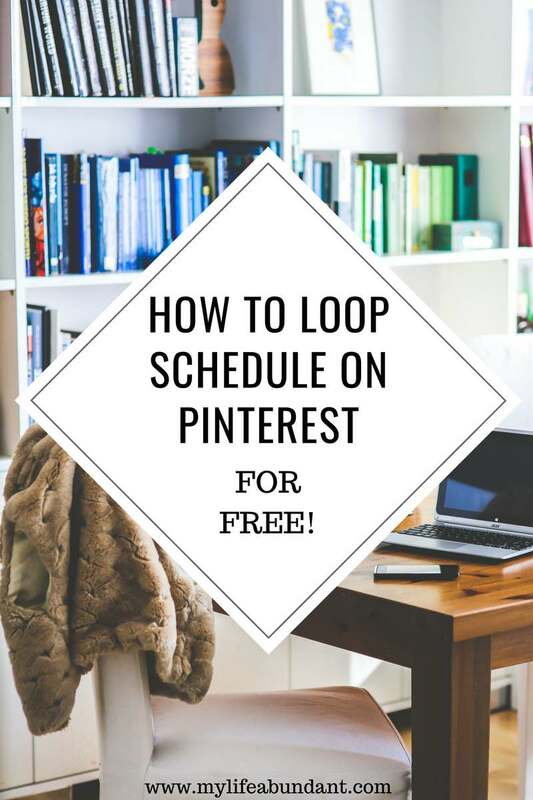 But using this looping schedule will help with your pins-per-day goal and I will have about 10 pins a day of my posts looping at different times of the day. I will also be pinning other pins, which are not mine, manually. I figure I can take a few minutes out of my day, grab my phone and pin a few. You can do this while standing in line, waiting at the doctor’s office or just some downtime. I hope this post has been helpful and if you have any questions, please ask. I’ve never heard of this before. I have a VA that handles my Pinterest repinning and I’ll have to tell her about this. We use Tailwind but this is a great way to set a loop schedule. That is quite interesting. I definitely think I need to check this out. It would make my life a lot easier and I love that it’s free. Hi Jeanette, The idea of not having to pay for another scheduler is why I am doing this process. Thanks for stopping by. I did not know about this! What a helpful post. I am going to try this for sure. I’ve been wanting to use Pinterest more often. This is something totally new for me, never heard of it before. Like how in depth you went to explain everything for us to understand. Pinterest can bring a ton of traffic. This is such a helpful post. I had no idea that this was even possible to do for free. I can’t wait to give this a try. Pinterest is one site I need to learn more about and get better at using so I don’t have to pay someone to do it for me. Although it saves me time to work on other things I need to be working on so having her is a plus as well as a hindrance. This is very interesting. Pinterest can be powerful but the tools used to automate it can be costly. I like this idea so much. I will bookmark this page for later reading too! These are very helpful tips to me for pinterest. As I am new in this field it really helps. I’ve never heard of loop pinning before. I know some people pay for schedulers, I still do it manually for a few minutes. Great post! Very helpful especially for those who are new to it. Can’t wait to try this. This is very helpful, I didn’t know you can schedule post on pinterest. I am not a techy person so codes and I doesn’t match lol. I’ve personally never tried any of the services for scheduling and it’s good to learn about a free service so you can at least try it out first! I really appreciate you sharing your experience and how you make it work as well. Wow, talk about saving time! I really need to go check this out right now! We currently use a scheduling service. It would be amazing if we could do it ourselves. I’m hoping to try this method, soon! I haven’t tried anything else before. Thanks for all the work you put into this post! I’m working my way through your instructions! To double check: when I’m adding the pinterest pictures into my calendar– I’m logging into my blog and going to my Media Library to get the url link for that pinterest picture– right? Ok, So I made it to the end! One more question! So— I only need to make one Applet for each board– I do NOT need to make an Applet for each post? Even though it was specific post information that I added to make the Applet? Wow…. If so that sounds great! I just need to get the rest of my posts on my calendars, and make the applets then. It seems like it will be time well spent. I hope so! You only need to make one Applet for each board to Google Calendar. Or from one board to another board. I have been watching this system for several months now and it works like a charm. My seasonal posts I will have to put in every season but you choose Custom and make your post last 3 months, etc. So I now have at least one pin set up to each calendar, along with the corresponding applets. It’s working like a charm– and my pinterest count is up! I just need to finish setting up pins on the calendars…. But I have a question about looping pins– Isn’t the idea to get somebody to like One pin a whole bunch of times? Doesn’t have multiple pins of the same pin, reduce that? Won’t my boards get cluttered up with the same pins pinning? Does Pinterest really like this looping/ repinning thing? I understand that by repinning, it is throwing the pin back out into circulation again… just wondering about all of the above…. and, is weekly okay? Or should I stick to monthly? I may be doing it all wrong, but I see it as if I can get more pins out there that means more eyeballs are seeing it and coming to my site. Remember that the feed home page will only show your pin at the time it happens and moves down. Kind of like Twitter. I do pin a post once a month. Some seasonal I may do every couple of weeks but they go to different boards. Hope that helps and glad it’s working for you. I know my visits have gone way up since I switched to this way. YAY!!! I went through the whole process Tammy! I have many more to add but I just did my 3 latest posts and then I will add more. I hope it helps. One question, can you delete pins? If you delete pins over time if a board fills up with too many, will that automatically delete the pin that someone saved? I don’t think the new Pinterest lets you see the number anymore. I used to delete pins that had a low number or a 0 next to it but I haven’t been able to see that anymore lately. I have been confused by that. haha. Thanks so much for your tutorial!! HI Kathleen. Glad to see it works for you. I’m not sure what happens when you delete a pin. I haven’t done that before. I’ve been looking for a tutorial like this FOREVER!!! Thanks so much!!! Hi Tammy, I have one more question. If I set another pin up and keep it located on my computer instead of on my website, how do I give the title location for that image? Just the thread of folders and directories on my computer? Just wanted to check before I did that too and wasn’t sure if that would be any security risk. Hi Kathleen, I’m not sure what you mean but all the images for the pins I right click on the picture I want to show for the pin in the post and use it for the link. The pictures are stored on my blog. Are you talking about using another pin picture for the same blog post? If so, I would still store it on your blog and then use that link for your pin picture.